I've always loved cars, and more recently, motorbikes. 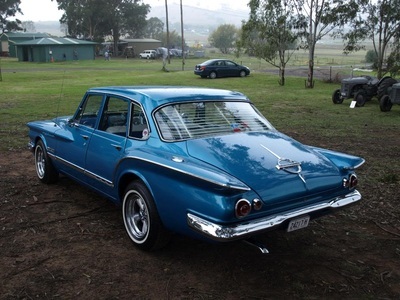 My love of old cars started when I was probably 15 or 16, when it dawned on me that the old white car my Grandfather used to drive us around in, was actually a classic looking old machine that looked so different to other cars at the time - it was a 1962 Valiant. I owe a lot to that car, in that ( I guess ) it made me who I am today, with regards to tastes and hobbies. 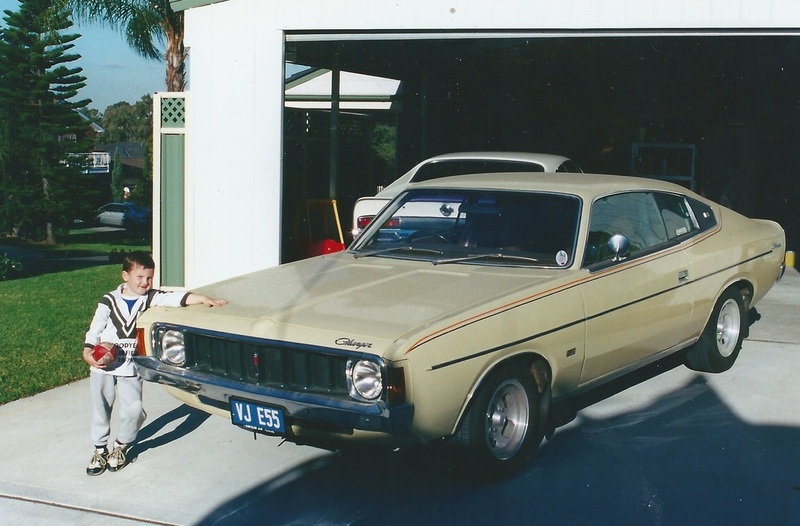 I remember sitting at my Grandparents dinner table with an old "Street Machine" magazine, and in it was an article on this old yellow Valiant, which just happened to look identical to my "Pa's" car which sat out the front. I remember saying to him that we should do his car like the one in the magazine - not realizing for a second just how much time and money that would be - but I remember my Pa saying if he ever painted his car, he'd do it white. I love the styling of the car in the mag, and especially the chrome wheels it had on it. It's sad that I actually ended up with Pa's old Valiant because he passed away suddenly. In any case, I got Pa's car, and it was almost my first "real" car, in that I got it when I was about 17 years old. I knew nothing about cars, and never had anyone who could really help me with it. 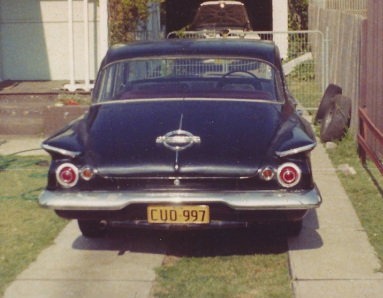 I wasn't even really sure what a "Valiant" was, except mine (Pa's) had fins, lots of chrome, and looked cool. Then I met Michael Boyd whilst at Fairvale High School. Michael turned out to be one of my best mates, and someone I'm happy to say I still am mates with to this day. Turns out he had a Valiant as well, and I guess that was it..........Mike and I ended up "Mopar Men", without probably realizing it at the time. 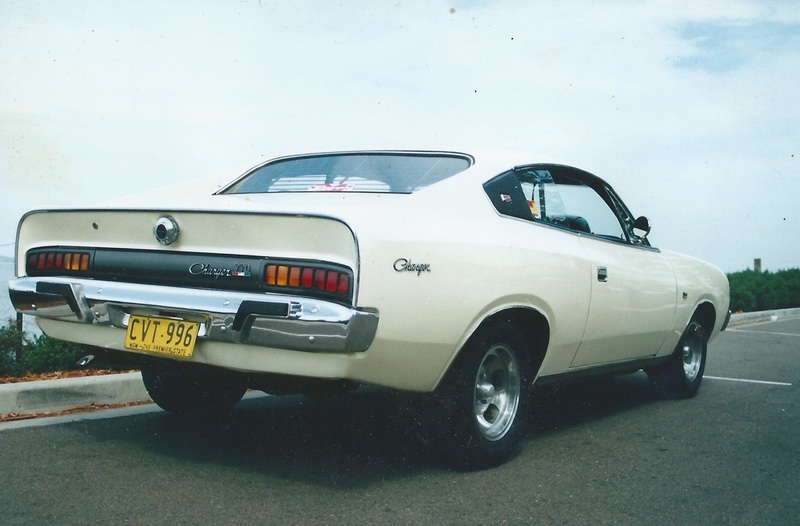 Whilst others were crowing about their Fords and Holdens, Mike and I were estolling the virtues of the Mopar product and learning bits and pieces about them as we went along. 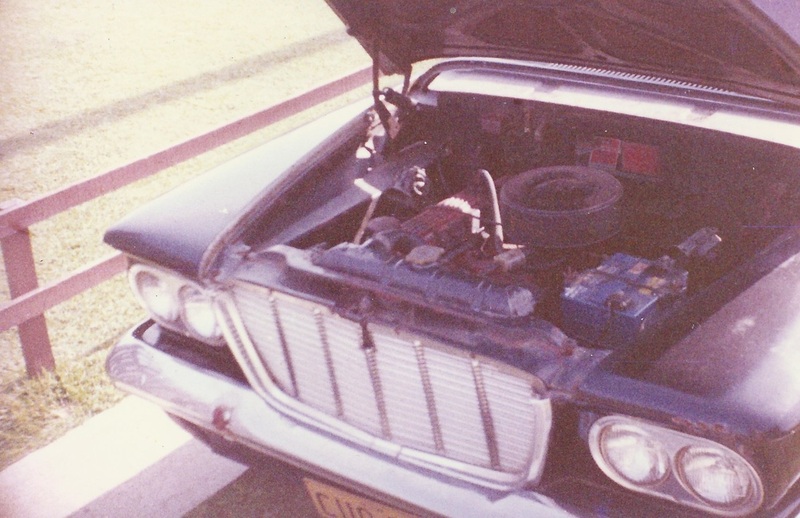 Mike also had an old 1966 Dodge Phoenix which he got on the road over a few years, and then - unfortunately - on it's maiden trip with a few of us in the car, it got destroyed in a hefty accident in Parramatta. In any case........it turned out I'd always have a Mopar (Chrysler) of some kind over the years. 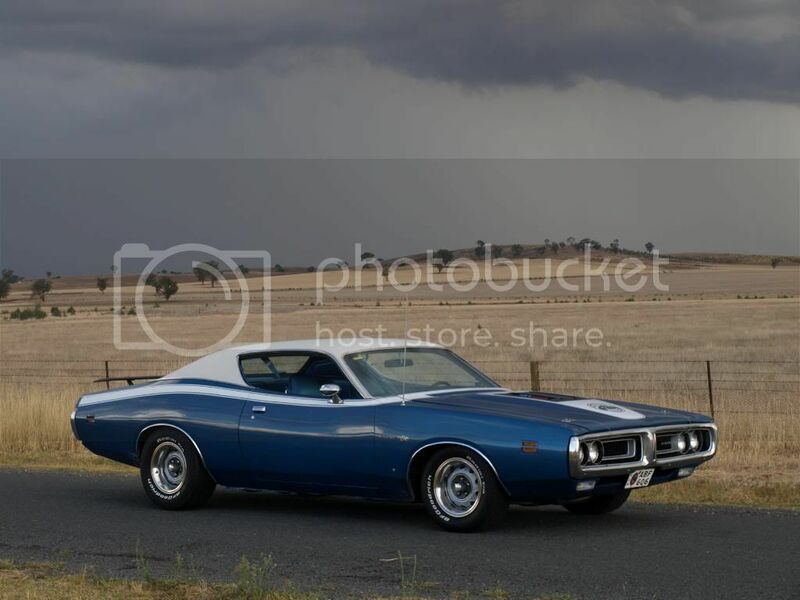 Each time I'd get something a little nicer until finally I got what I considered my favourite....a 1971 Dodge Charger Superbee. 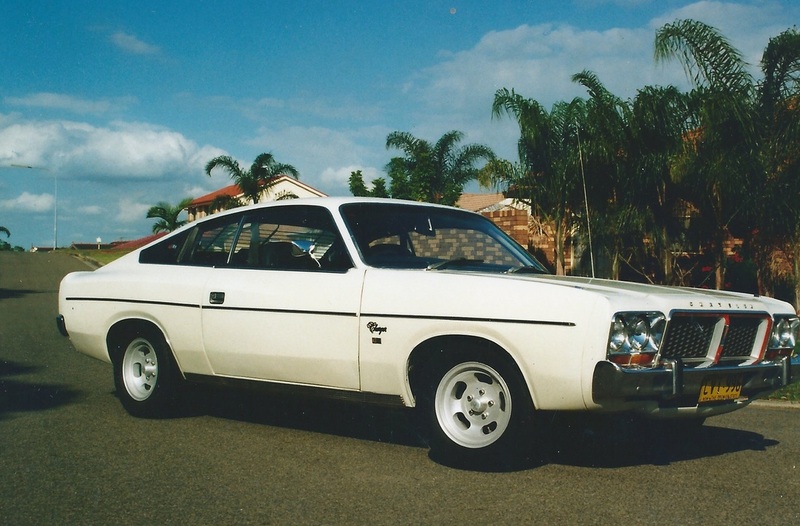 Of course, over the years that old Valiant of Pa's - the car I swore I'd never sell - was a constant. Whilst all the other cars came and went, the old Val was still there, getting better and better each year. That is until 2013 when, after a very long "think", I decided it was time to let it go. In any case.......here's some picture of cars I've owned along the way......or at least the ones I have pictures of. Oh, and if I hadn't gotten a Valiant, what would my favourite have been ?? Mad Max's black Ford Falcon Coupe - The Interceptor - or indeed any Ford Falcon coupe (XA to XC). I loved 'em, but unfortunately never got one. 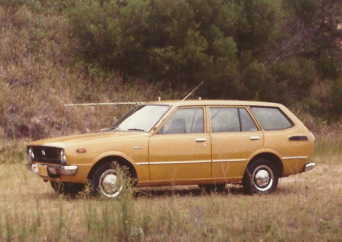 1976 Toyota Corolla Station Wagon. Officially my first car. Whilst I had the Valiant, I wasn't actually driving it, and so - with money I'd won off radio stations - I purchased this little wagon. 4 cylinder engine and a 4 speed gearbox. It was a cheap little car, and even though I hated the colour, it served me well in my early years. 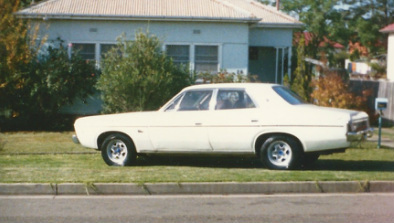 Early on I was told my Valiant wasn't the best example, and that I should maybe find another to work on instead. So, I bought another s Series....a black one from an elderly gent in Heathcote. He'd owned it since new, and decided it was time to sell. I gave him $1000. It was a column shift manual, with a red interior. The rego no. was CUO-997. I sold it after a few months, because I just couldn't bring myself to not do up Pa's aold Val. It went to some young bloke who was in Uni, from memory, and don't know what became of it. I wish I did. 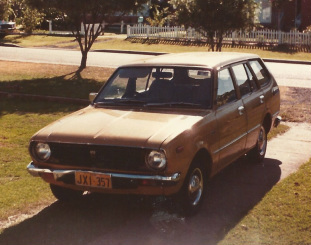 Early on I thought it would be good to own one of the later Valiants, because they were considered the best made models, and came with a lot of "luxury items". 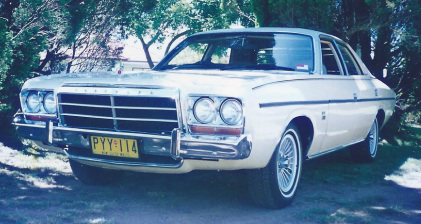 You have to remember that Chrysler left Australia in 1981, so something like a CM Regal S.E was considered the top of the line. 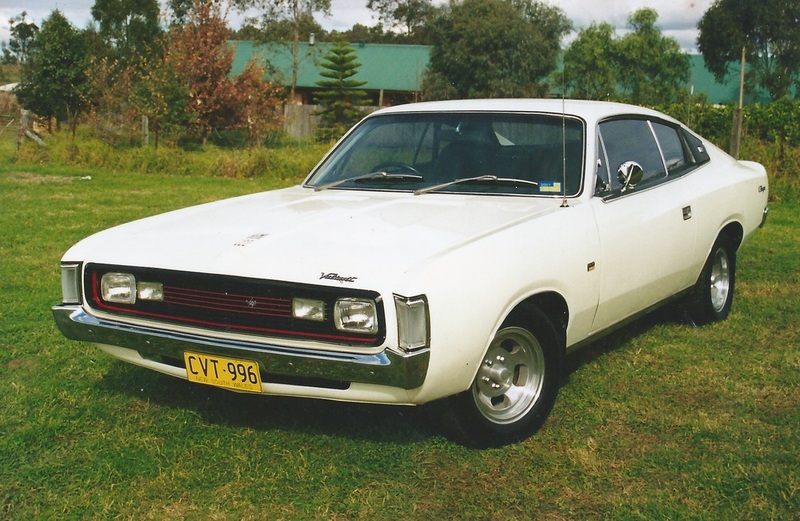 I started off buying a white 1976 model CL Valiant.....bog standard, it even came with a bench seat and column shift manual. Over the years I progressed to a couple of Regal S.E models - first a CL S.E and later a really nice CM S.E. We brought the kids home from hospital when they were born in the CM. 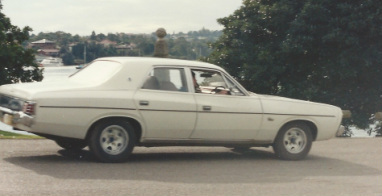 It was a 318 V8 with a leather interior and converted to run on L.P.G. Of course, like all my cars, I eventually sold it for something else. A Gold S.E I bought was a good "luxury" car to start with, but it was too rusty and I sold it to another Chrysler owner for a pittance......he was an incredibly fastidious Chrysler owner who loved CL and CM cars. 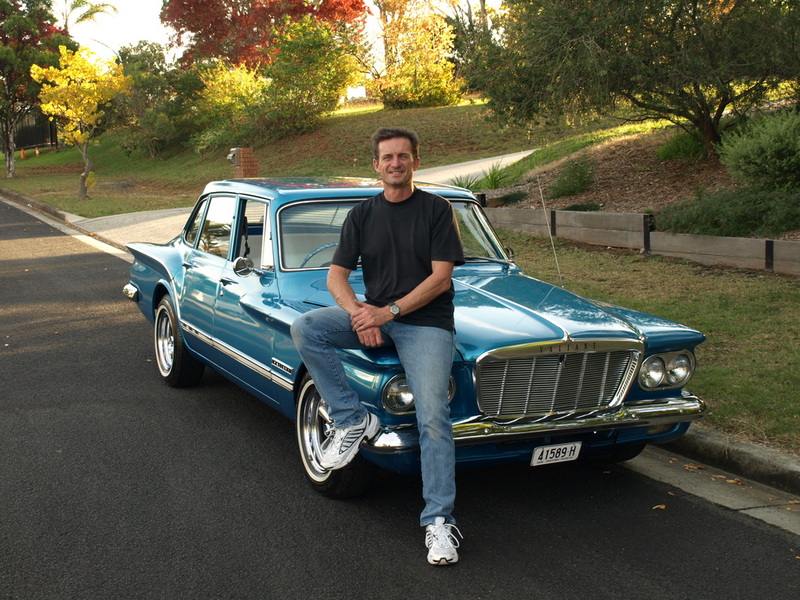 He restored the car to pristine condition, changing it to green, and I now see it occasionally at Chrysler shows. It's beautiful. A Charger was always considered a "performance" Chrysler. It didn't matter if it had the smallest 6 cylinder in it, the Valiant Charger had a good name on the street, and the fact it was a CHARGER meant that everyone thought it went fast. My first Charger was a 1972 VH modelcame from Forbes in Country NSW. I got it for $600 from another elderly man who simply didn't drive it anymore. It had really rusty rear quarters and blew heaps of smoke. My dad drove me to Forbes to look at this thing and I almost didn't buy it. Sure, it was the right colour - Hemi Orange - but that was all it had going for it. It was the most "base model" Charger I'd ever seen. Bucket seats that didn't recline at all, drum brakes all round. Column shift "3 on the tree" manual. and the clincher.....a 215 single barrel Hemi.....the smallest of the Chrysler engines and I'd never even seen one till this time. It even had rubber floor mats, and didn't come with a radio. We managed to get it running, but the thing I remember most is how much smoke it blew. We went into town and bought the thickest engine oil we could so as to try and stop the smoke a little so we could drive it home. Sandie and I jumped in it, and made the decision to try and get it back to our home in Canley Heights....hours away....and my dad would follow us in his car. Well.........we found out that the fuel gauge also didn't work. Sure enough we ran out of fuel along the way, and it was lucky Dad was following us. 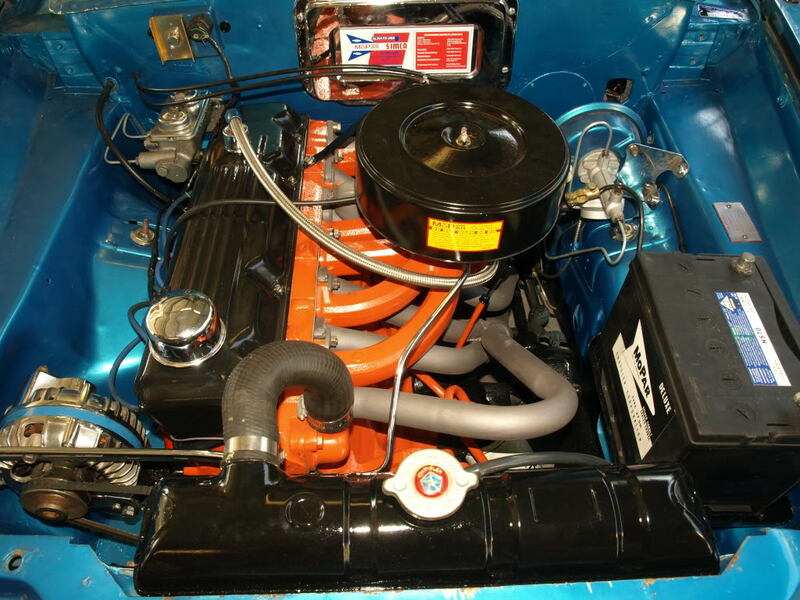 Y'know, for all the things I said were wrong with the car, one thing I remember is when we finally got to a garage and I put some fuel in.....under the garage lights at night, that Hemi Orange Charger looked a million dollars. We even had a couple of people comment on it. When I got it back to my mums, I set to work in the front yard making it into something I really wanted. 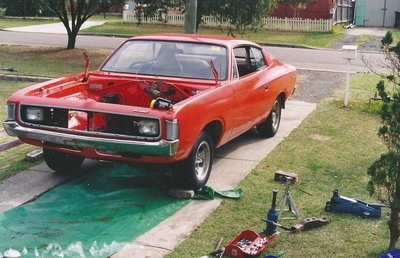 I bought another old Valiant CM with a 265 Hemi and a rusty old CL Charger with a 4 speed box. I pulled the front alloy brakes off the CM and ripped out the motor, and put them in the Charger. I then grabbed the 4 speed from the CL Charger and stuck it in the VH. When I was finished, I got a mate of mine to go to work on the rusty rear quarters - that was a big job, but in the end it was done. That VH Charger looked great, and whilst I eventually sold it as well, it was the first sporty looking Chrysler I owned. I eventually bought a few more Chargers. A white CL 770, and then a white VH 770 with 265 before finally buying a friends 1973 VJ E55 Charger. This car was a great car - beautiful to drive. Look up anything about E55 Chargers for what made this car special. When I sold this car, it was for a good reason, but to this day I feel I sold it way too cheaply. 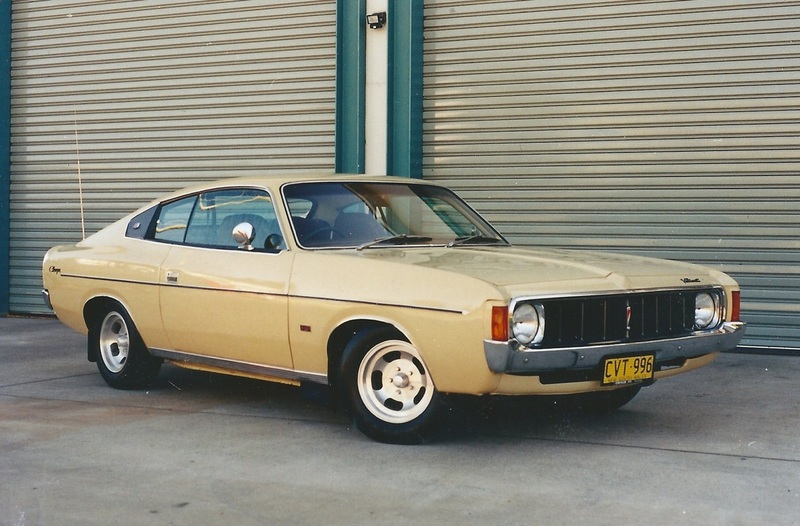 Mind you....whenever I looked at it I always just saw a beige Valiant with a brown interior.....it was actually a lot better than that. Time To Buy A U.S Mopar. So.....after years of owning Valiants, and a few other cars along the way, I decided that it was time to step up to real Mopars - a U.S model. I wasn't sure what I wanted, but one year when I was at the Chrysler On The Murray car show in Albury, I saw this sleek looking "sharky" car that really appealed to me. It was a 1971 Dodge Charger S.E. I loved the shape. It grabbed me straight away. Most guys went after the E Bodies like Challengers and Cudas, but I really liked the shape of the Charger. So, I went home and began searching for a nice 71 Dodge Charger. I eventually found a car I liked in Farwell, Minnesota. It was owned by a guy called Todd Hyatt, and I imported the thing to Australia. It truly was a great car. It looked good, it went good and it sounded good. It had a 383 Magnum V8 and auto. It was a genuine 1971 Superbee with stripes to match (I loved the stripes). When I got it, it had a black vinyl top, but the VIN tag said it was supposed to be white. I wasn't sure I wanted a white top, but after getting it done......it looked good. I had the Bee for quite a few years before selling it for........a Harley Davidson - 2009 Softail Deluxe. The Dodge is one car I kind of regret selling. It was a really nice machine. It had the looks and the go to match. ​1971 Dodge Charger Superbee. 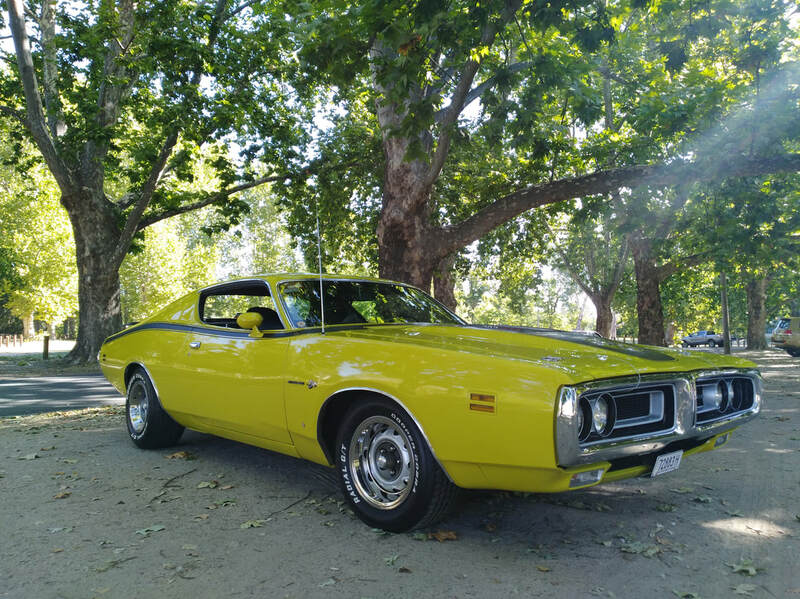 To see my new BEE, click the link on the header "1971 Superbee".